We love bold, bright hair colors like Katy’s and Pink’s. But the idea for this post comes from a controversy that’s taken on a life of its own after Sunday’s Billboard Music Awards show. Katy’s true blue & purple streaks? Ms. Perry has favored this type of color scheme recently, and often the results are subtle like this. We haven’t heard about any fashion “expert” who compliments the shades. Maybe we haven’t looked in the right places? Doesn’t matter, this combination is pretty even when it’s more noticeable hints of pastels. Pink wore white-hot platinum in a cropped haircut with grand pomp and circumstance. Few real women could pull it off, but Pink can because she’s beautiful and confident enough to bare her face–that’s exactly what this ‘do does with its long lifted crown and buzzed sides. 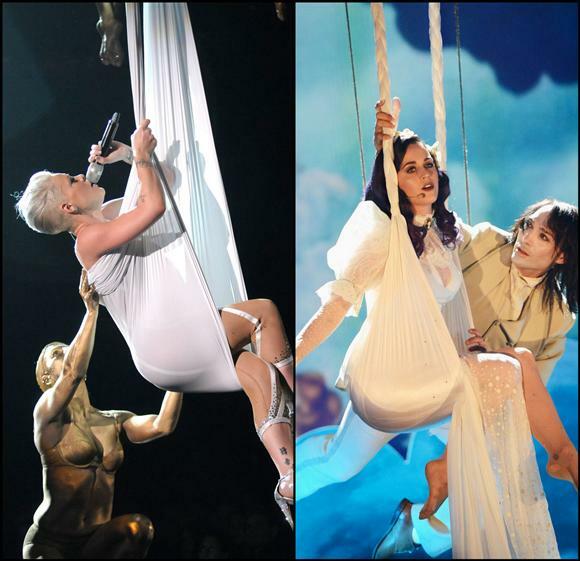 The photo of Pink-on-white isn’t from Sunday’s Billboard gala, yet it’s more representative of her one-of-a-kind multicolors! We’re not sure if we’d ever dare to wear something so “out there”…unless it’s temporary, for a day or two. We’re more likely to try something subtle like January Jones’ pink streaks from Spring. In the end, we never say “never” when it comes to hair! Bold & Beautiful…slightly on The Wild Side…only for Girls Who Wanna Have Fun? Most important: Does it work for real women? What do you think? See Reader’s Poll below. Before you vote, you might want to see details at Goldwell Color Zoom ’12 FasciNATURE Collection | Mischo Beauty. Is there anyone out there who likes Aubrey O’Day? 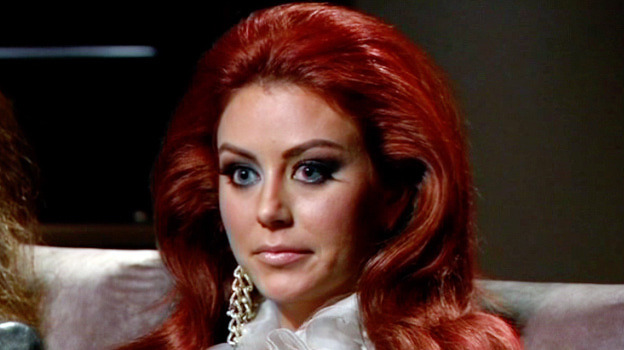 We admit we’ve been harsh on Aubrey O’Day since opening day of Celebrity Apprentice 2012. Now we want to give you a chance to express your opinion. We especially want to hear from fans of Audrey or those who think we’re totally off base. To help us analyze the results (and if you feel like it), indicate your gender in the comments section below. And what about her hair? Celebrity Apprentice: We hope Aubrey O’Day has been fired, but we doubt it! Aubrey said her hair is ‘all real’ last week. Can you believe it?! May 13, 2012–Right here, right now begins our near-to-final thoughts about this year’s C.A. But in the interest of full disclosure, we should say it’s really a continuing critique of Aubrey O’Day. Since the clock’s ticking, this is a QuickPress, and the first posts to follow will not highlight her hair. Instead they will sum up why we love to hate Ms. O’Day, why she should NOT BE CELEBRITY APPRENTICE and why she never should have made it this far in the competition of celebrity wanna-bes. Really C.A. should be called a NON-reality show because we doubt any successful CEO would consider most of these D- and F-listers as real job candidates! Researching this series has been super-easy, not to mention confidence-building because the data validates the truth behind our biased opinion! So far there’s overwhelming evidence that Aubrey O’Day just might be the most dis-liked Celebrity Apprentice wanna-be ever! Exhibits B & C (above right and below) speak to Aubrey’s love of herself, her exhibitionist tendencies and her bad taste in everything from hair to fashion to morals to ad infinitum. We’ve already gone on longer than planned, so we’ll stop here…until next time! Can you believe these celebs are in a Best-Dressed poll?! Countless celebrities flaunted their stuff at this week’s Met Gala. The guest list included Kristen Stewart (clockwise from top left), Leighton Meister, Carey Mulligan and Lily Collins. At another web address, you can find a Readers’ Poll that includes these stars as choices for Best-Dressed…what were the survey writers thinking (or drinking)??!! To see the whole list, go to that Poll. AND please leave a comment to say whether you agree with us or not! 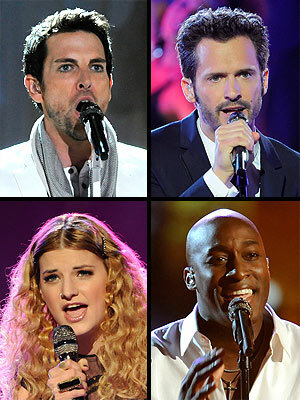 Who will win ‘The Voice’? Tell us what you think! or Voice your opinion after the show! And the finalists are (above, clockwise): Chris Mann, Tony Lucca, Jermaine Paul and Juliet Simms. NBC photos. Coming soon: news on The Voice…more predictions, more about their Celebrity Styles and our fave guest stars (hint, hint: Lady Antebellum), etc., etc. AS FOR NOW, we predict Chris Mann and Jermaine are the Top Two Voices, and that Mr. Mann has a slight edge.